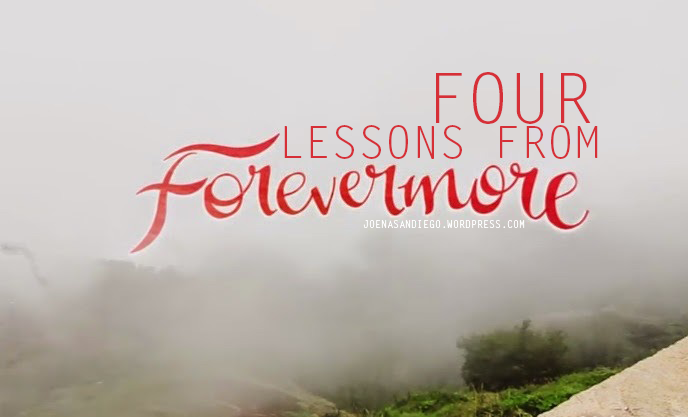 Kahit ang dami ng naiinis at nasisira ang araw kapag pinapanuod nila yung mga latest episodes ng Forevermore, I think the show still deserves some credit because behind all those “Bakit-hindi-na-lang-makipagbalikan-si-Agnes-para-happy-ending-na” scenes, it still offers some quality lessons. Pansin mo, bakit kailangan ni Xander lagi ng babae para magbago? 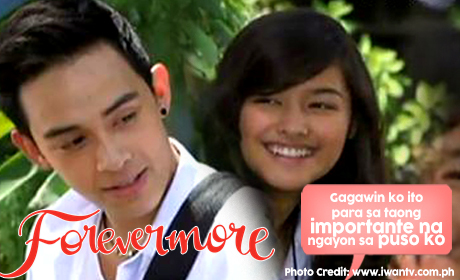 Nakilala niya si Agnes, from being a bad boy, he became this loving helpful and nice guy. When things got complicated between him and Agnes, he became miserable again (Still because of a girl! Remember the character of Kate?) and ended up making decisions hurting the people around him. Came along this girl named Alex, who saved him from the pain of a broken heart, he changed again to a guy who managed to put himself back in the game. My point is.. kung ang security niya ay na kay God at hindi sa babae, he woudn’t end up wounded. Be a whole person so that desperation doesn’t have a chance to set in. If you are waiting for someone before you get on with the rest of your life, forget it! You won’t meet your “the one” until you get busy. 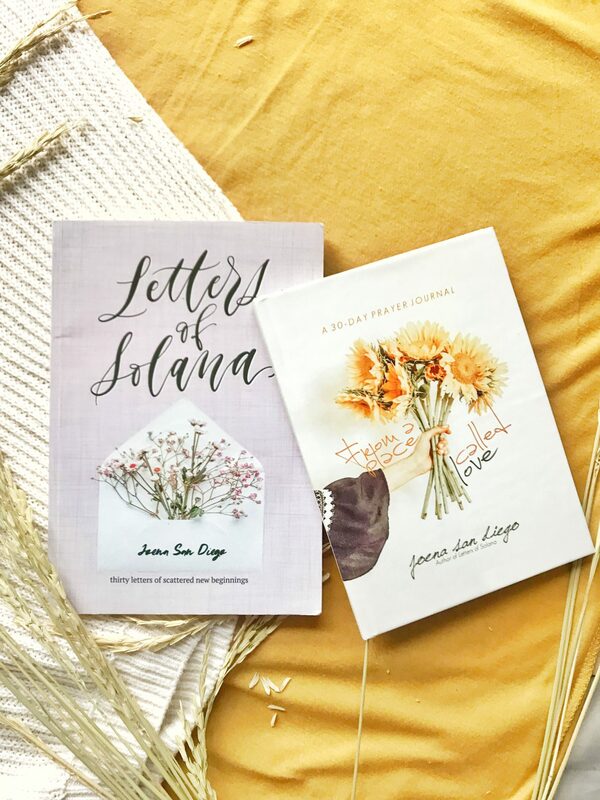 After all, pwede namang mangarap at gawin ang mga pangarap ng mag-isa di ba? Single and happy. You woudn’t know maybe your mate is probably waiting on the other side of your dreams. You will meet her when you get on with your life. In the meantime, you will be happy and fulfilled because you will be doing what you were always born to do. Besides, there’s nothing more attractive than seeing a person who is feeling fulfilled, being all that they can be. This will give a reason for your future mate to boast. Hindi naman dahil na friend-zoned ka, ikaw na ang pinakapanget na tao sa buong mundo. Hindi ganun yun, pare. Minsan, blessing pa nga na kontento ka na being a friend. First point, I think if a guy had taken the time to REALLY know a girl better (instead of making all those efforts to be her boyfriend), he would have understood that she wasn’t ready — and he would have put himself in the friend zone. Katulad ng ginawa ni Alex sa sarili niya. What a noble man. Okay, lets say you meet this lady who passes all your standards. Maganda, mapagmahal sa pamilya, matalino, and godly! But dude, just because someone is a beautiful person, doesn’t mean you should pursue them romantically. There are many reasons God may have allowed your paths to cross. First and foremost, we should assume that God places people in our life for His Kingdom purposes and not necessarily a romantic relationship. Second point, there is no better way of knowing someone than being in the friendzone. When you meet someone, the first thing in your mind shouldn’t be, “could I marry this person?” Nothing is more self centered than trying to decide if they are relationship material before actually knowing them. Instead, we should be thinking about how we can love, serve, and get to know them, regardless of who they are or what they look like. Last point, don’t use your privelege of being in the friendzone as your pass in getting into a relationship. Get the right motives. If it is God’s will for both of you to enter into a romantic relationship, He will be the one who will make your friendship grow. Take these words from Kate. Actually no. Take these words from every single girl in the world. Ang sakit di ba? Most of the times, ang dami kong nakikita na posts sa social networking sites of girls begging for love. I, myself, have been there once. And if only I could go back in time, I would tell myself to stop. Baka nga, I would slap myself pa just to make sure that I would wake up to the truth that I am already loved… immensely loved. How do we get so blinded? Why do we, girls, keep on running after someone who don’t even care about us? Why do we keep on begging for love? Girl, be contented. In fact, don’t lower your standards. You are made for a greater purpose. You are NOT the dress on sale. You are the exquisite designer dress displayed on top! In truth, prinsesa ka nga eh. Don’t turn yourself into a monster. Remember, when you meet a man, keep it cool. It doesn’t matter what you’ve heard about him, how cute he is, how the crowd loves him, or what kind of car he drives. Check his character, his actions, let him lay down to you his full intention before you grab it widely. Let him do his job. And as royal princess, don’t go in saying.. “Oh Lord, please let this be him.” That is not a royal posture at all. Wait. Inhale, let God lead the direction, exhale. You know pwede kang magkaroon ng boyfriends as many as you can, but you will only have one Father. And I know that not all people have the perfect father who they want. Others might even have terrible memories with their dad but here is one love letter that I sincerely want to share to everybody. And I believe that this love, this is forever.